Last week I shared my ideas and plans for my office/craft room. Really I just want to call it MY room. I didn't take great before photos, but this will at least give you an idea of where the room started. As you saw on the floor plan the other day it is in the back corner of my first floor, and really it's only about 10' x 10'. You can see the original color I painted the room when I first moved in. This was the very first room I painted in this house, actually I painted it before I even moved in. 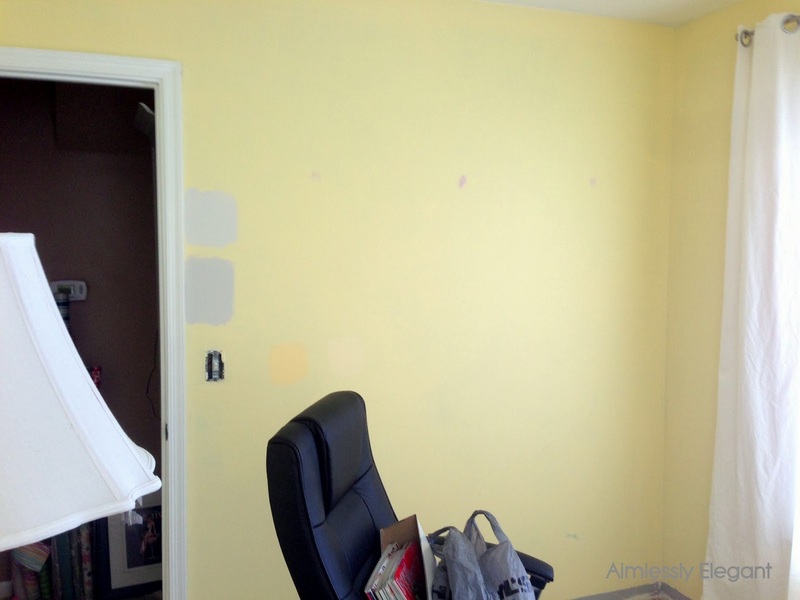 I really wanted a yellow office for some reason, and I almost stuck with yellow when I decided to redo this room. If you look closely you can see a few swatches of yellow just to the right of the light switch. Then I totally jumped ship to gray. There were a few reasons behind this switch. One, in thinking I was going to keep the room yellow I was looking for a bright vibrant floral rug and I just could not find what I had in mind. I had searched for months, high and low, and was coming up empty. Two, I just got a feeling that I needed a more calm space. More serene and light, so gray it was. The swatch on top is the one I ultimately ended up choosing, Irish Mist by Behr. At this point I had already taken out the baseboards and ripped up the carpeting. You can see the too short curtains with the hems unraveling. 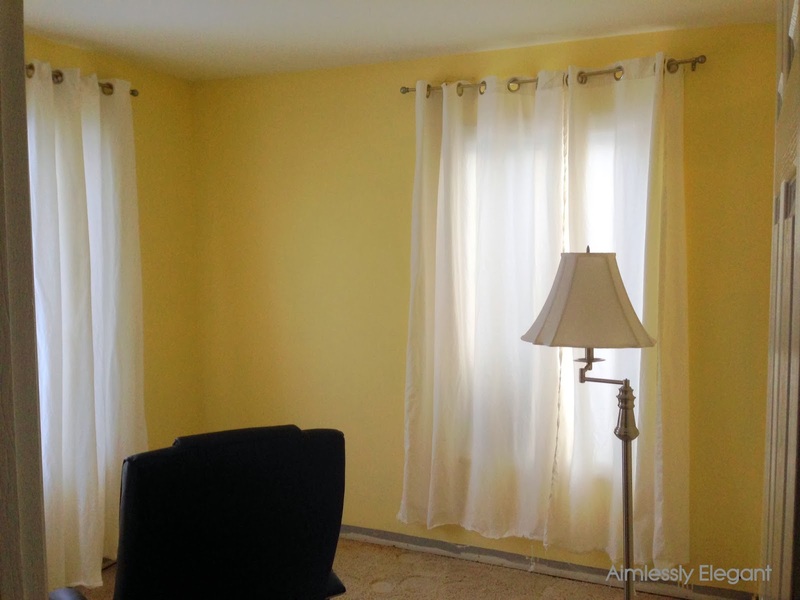 The plan is to keep the curtains, and add a fabric trim along the bottom to remedy the length. I have yet to find the perfect fabric for the job. My husband and I got started on this room before the Holidays, which was actually much later than anticipated. The floor had been ordered in early November in hopes of getting it down Thanksgiving weekend. Unfortunately the floor did not end up coming in until mid December. But I couldn't stand having things pile up around my house right before the holidays, so to work we went. I got the room painted one Monday, and then during the week Martin surprised me by putting up the crown molding in the room. Something I did not anticipate going up for awhile, I always knew I wanted to add it. In fact I want to add it to most of the house. Martin didn't only put it up while I was at work, he did the whole nine yards. Measured, bought, installed, caulked, and painted - it was a great surprise! The next weekend we laid the floor. It is a click together laminate floor, it was easy and fast and took us just a few hours. A few more hours and we had the base molding in and painted. 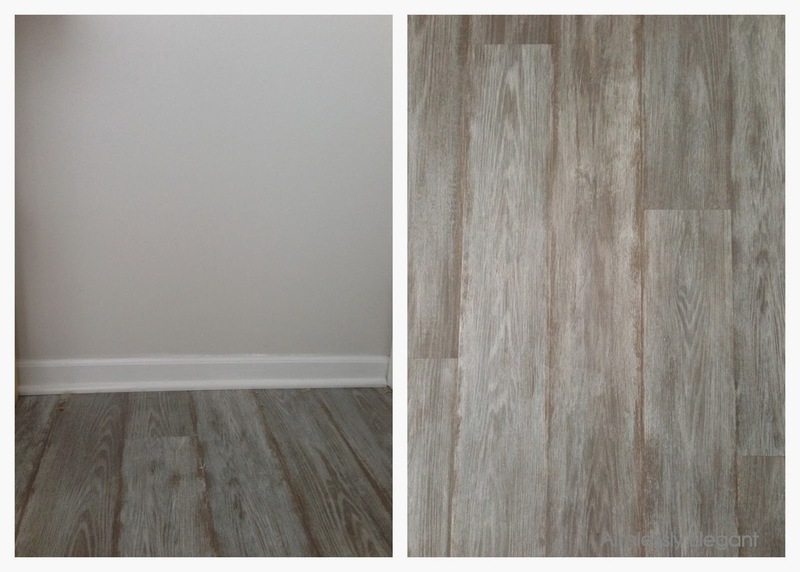 I was a little hesitant in picking out a whitewash looking floor online, but I absolutely love how it looks in person. I also feel like the paint color is just perfect with it. In the daylight it can wash out to nearly white, but with the help of the baseboards and the crown molding being white you can see the gray tones. All the major pieces of furniture have been purchased and assembled. Now it all just has to be put together. I will leave you with a sneak peak of one wall. This is the one large piece of furniture that was not on my design board. It is a piece I overhauled last year, it started out as BESTA unit from Ikea. I added some trim and painted for a more 'me' look. The shelf is by no means organized, infact I put as much on there as I could when I was clearing the room to be painted and have not touched it since so please forgive the mess! The rack to the left (a TJ Maxx find) is the first thing to be hung on my freshly painted walls. I am on the hunt for some smaller accessories and storage pieces. I hope to get more accomplished this coming weekend, and hope to soon have more to share! Thanks for following along.